Our range of cotton print fabrics are perfect for your home craft projects, from making cotton printed bags to light summer skirts. 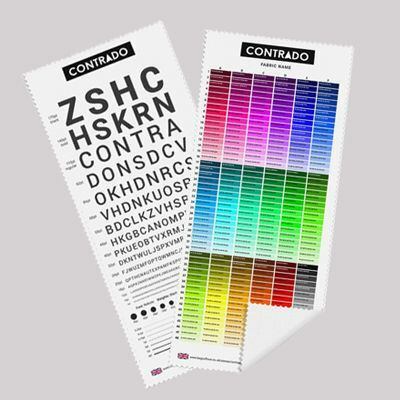 The printing process ensures your unique design is beautiful and long lasting. A handmade item is one thing, but it's another when it's made using your own custom cotton print fabric. Working with cotton is so easy, and the results are spectacular. Our innovative printing process for cotton gives a clear and exceptional print on natural fabrics as well as cotton blend, as it bonds the ink to the material. Cotton by nature is soft, durable and a match made in heaven for dressmakers as it's a breathable, moisture wicking fabric. But being so versatile in the different textures, weights and blends of cotton print fabric available, it's perfect for beddings, crafts and underwear too. Have fun getting creative with cotton! Choose from 100% natural cottons and cotton blends. Desaturated print for vintage, rustic charm. Lightweight, with high levels of absorbency. Slightly starched. Semi opaque poplin weave fabric. Intense colors, bright face. Very fine brushed surface. Hard wearing, soft and breathable. Slight brushed surface with an ivory base tone. Lighter, thinner than poplin. Smooth and soft face with a matt reverse. Easy to handle. Very tight twill weave, locks in heat. 100% cotton. Light, airy and smooth on the skin. Nice drape. Use for clothes, furnishings. Cotton and linen blend. Cool and smooth on the skin, with some stretch. Slightly stiff finish. 100% natural cotton satin weave. Smooth face, matt finish. Reflects & absorbs the light. Crisp to touch. Soft, stretchy and breathable Cotton Jersey, ideal for body dresses, t-shirts. 100% organic half-panama cotton. Authentic flecks of cotton seeds. Visible basket weave. Breathable. 100% organic half-panama cotton with glossy waterproof PVC coating. Outdoor furnishings, bib linings. 100% natural cotton, distinctive twill weave, breathable. Structured, holds shape well. Soft on the skin. 100% cotton. Textured dobby weave. Heavy, crisp, starched handle. Cream base. Upholstery, apparel. 100% organic cotton. Poplin weave. Untreated with unique slubbing effect. Crisp with no give. 100% organic cotton, poplin weave. Untreated with authentic slubbing effect. Light and crisp. 100% natural cotton. Soft and smooth with a subtle shine to the face. 100% natural, 100% organic with a rustic, half panama canvas weave. 100% natural, 100% organic with a diagonal drill weave. On the whole we recommend a cold delicate wash for more gentle cleaning, or specialist dry cleaning. Hot washing at anything above 86°F could cause color fading. As with all natural cottons there is a significant degree of shrinkage in the print process and in the use you may have for the material. Please accept 2-3 % shrinkage in the X and Y directions. To compensate, we suggest to allow a margin of shrinking in your design. Do this by adding more bleed area in your design. It is not an exact science and we cannot predict exactly how one lot of cotton prints will shrink to the next. What Can I Make With My Cotton Print Fabric? The opportunities are almost endless. Use the light Lima Cotton to make a pair of seasonal pajamas. Due to the moisture wicking abilities, it can lock in heat as well as draw it away from the body, so bedtime will always be comfortable no matter what the weather. Or use the Cotton Twill, which is slightly thicker, to use for upholstery, scatter cushions or your craft projects. Please note: When choosing Midnight Dream Cotton Sateen, due to the print process large areas of solid color may show minor blemishes or discoloration. This is to be expected and we would advise avoiding large solid blocks of color if possible. 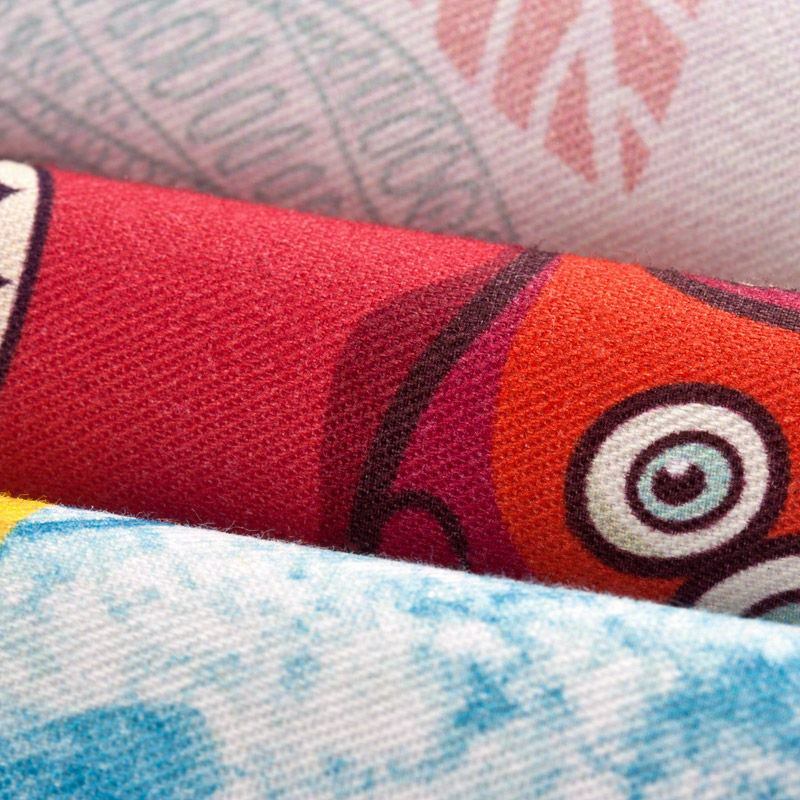 How Does Digital Printing on Cotton Work? This digital process gives your fabric a beautiful, slightly muted print that lasts far longer than other standard cotton printing techniques. It's slightly muted because of the natural fibers and zero chemicals used on the fabric. 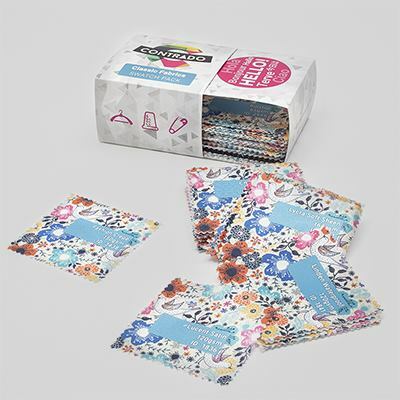 Your unique pattern is made from eco-friendly inks that are bonded with the fibers of your chosen cotton, meaning the print won't peel away or scratch off. Each individual cotton has its own base tone, ranging from brilliant white to muted ivory, giving your finished print a unique look. As it comes. We roughly cut around your image, leaving a simple scissor cut (perhaps uneven white fabric border). Hem with thread. We can hem your fabric with a choice of black or white thread. Please allow 1-2 days additional production time. See below for information on how hemming affects the size of your print. Cut on the line. We neatly and precisely cut on the edge of your image. If you choose to have your textile finished with a hem, please bear in mind these measurements and ensure you factor this into your dimensions. Light fabrics: we use 0.23"-0.31" in the hem (twofold), so your width/height will be minus 0.47"-0.63"
Medium fabrics that fray: we use 0.59"-0.78" in the hem (two fold) so your width/height will be minus 1.38"-1.57"
Stiff/heavy/no-fray fabrics: we use 0.59"-0.78" in the hem (single fold) so width/height will be minus 1.38"-1.57"